Norwich is a beautiful city and providing you have enough time with us, totally reachable whilst you are enjoying your Norfolk Broads holiday. Norwich is the only city to be situated in a National Park. It was once the capital of England, following a successful period of affluence with the thriving wool trade. 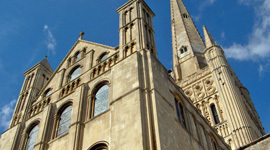 With over 1000 years of recorded history, a wonderful collection of heritage landmarks and striking 21st century architecture, Norwich has something to offer everyone. Bustling during the day with shops and cafes, there is also plenty of culture and sights to entertain in the evening too and it’s well worth a visit during your Norfolk Broads holidays. Head up the River Yare, and onto the section they call the Wensum. You can moor up at Norwich Yacht Station which will cost £5 for the day or £12 overnight. Located in The Close which is accessed via Riverside Walk (the other side of the river to the Yacht Station). Donations for entry into this spectacular example of religious architecture. The spire is the 3rd largest in England and has been home to a pair of Peregrine Falcons since 2009. 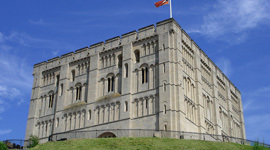 From palace to prison, explore the Castle Museum found on Norwich’s high point between Castle Meadow and the Castle Mall. Featuring special exhibitions throughout the year, entrance is £8.80 Adult and £7.00 child. Award winning Great British High Street of the Year 2014. 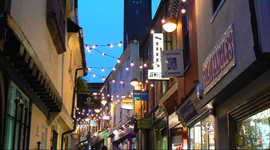 Take a wander around these architecturally pleasing streets and browse some of the unique boutique shops, cafes and pubs. Choose from the Playhouse 01603 612580, Theatre Royal 01603 630000, Maddermarket 01603 620917 and the Assembly House 01603 626402 for some brilliant AmDram, professional and touring productions. 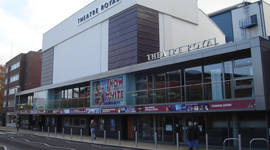 Norwich Arts Centre also showcase a range of local talent with plays, concerts and poetry readings.